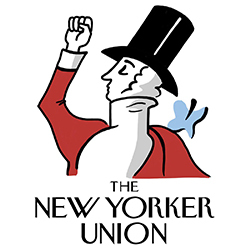 A month after employees at The New Yorker announced their intention to join together to be represented by the NewsGuild of New York/TNG-CWA Local 31003, The New Yorker has agreed to the Guild's request for voluntary recognition. Negotiations for a first contract will begin soon. CWA is opposing President Trump's nomination of Judge Brett Kavanaugh to the Supreme Court and calling on members of the U.S. Senate to reject this nomination, citing his long record of routinely ruling against workers and their families and regularly siding with employers against employees seeking justice in the workplace – including CWA members. Just last year, Kavanaugh issued a partial dissent in a case involving more than 300 NABET-CWA technicians at CNN who lost their jobs and the benefits of union representation in the wake of the company's phony reorganization scheme to get rid of union workers. He concluded that the company was not liable for violations of the National Labor Relations Act and should not have to pay back wages. Kavanaugh also stood with AT&T to prevent CWA members in Connecticut who interact with customers or work in public from wearing union shirts protesting their treatment by the company. He has held that a waiver of a right to picket allowed Verizon to prevent workers from displaying pro-union signs in their cars. Judge Kavanaugh's unwillingness to protect workers even extends to life-and-death situations. In a case involving the death of a Sea World trainer who was working with a killer whale, he dissented from the majority, holding that the Department of Labor lacks authority to regulate activities of participants in sports events or entertainment shows in order to protect their health and safety. Based on his record, it seems clear that if he is appointed to the Supreme Court, Judge Kavanaugh will continue to protect the interests of already powerful corporate CEOs instead of working families. As Facebook comes under increased scrutiny for its handling of personal information and its disclosure of data breaches, CWA is joining the Freedom From Facebook coalition and calling on the Federal Trade Commission to hold Facebook accountable for privacy breaches and other practices that have harmed consumers and to break up Facebook's corporate monopoly. "We should all be deeply concerned by Facebook's power over our lives and democracy," said CWA Strategic Research Associate Brian Thorn. "It's time for the FTC to hold Facebook accountable, impose strong privacy rules on the platform, and break up the monopoly. Anything else would be unfair to the American people, our privacy, and our democracy." CWA is also shining a light on Facebook's role in age discrimination towards job applicants. In December 2017, CWA filed a class action lawsuit against multiple large employers for their use of Facebook to prevent millions of older Americans from seeing job ads. 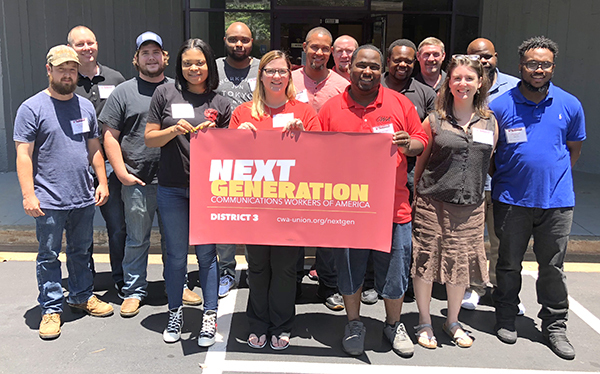 CWA Next Generation members from four District 3 Locals, including 3204, 3205, 3218, and 3865, gathered in Decatur, Ga., last month for two days of CWA STRONG training. 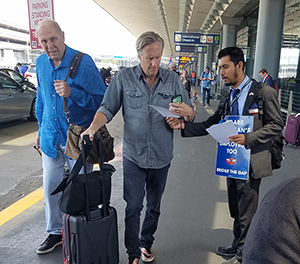 Topics ranged from the mission of the Next Generation program – a project of CWA to recruit, train, and mobilize young CWA members – to economic and social justice to how to actively listen to and engage coworkers in political battles for workers' rights. The participants at the training shared personal stories and learned how to use the power of those stories to engage and mobilize people through one-on-one conversations. Participants also created detailed plans for action and got helpful feedback on those plans, which will be implemented back at their locals this summer and fall. The training was supported by CWA's Next Generation Growth Fund. CWA Next Generation members from four District 3 Locals, including 3204, 3205, 3218, and 3865, gathered in Decatur, Ga., for two days of CWA STRONG training. 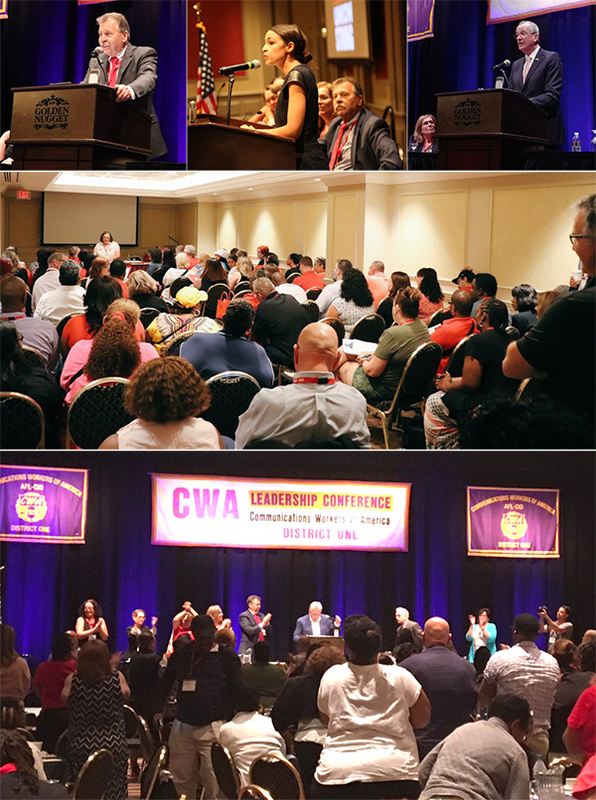 CWA members gathered in Atlantic City this week for the annual District 1 Conference. CWA President Chris Shelton, CWA Secretary-Treasurer Sara Steffens, CWA District 1 Vice President Dennis Trainor, and CWA District 2-13 Vice President Ed Mooney encouraged members to continue building the CWA STRONG program in the face of unprecedented attacks, including the recent Janus Supreme Court decision that took aim at public sector unions. "We are at a crossroads in this country and in the labor movement," said Shelton. "Business as usual won't cut it. Brothers and Sisters, we need to work like our lives depended on it, because they do!" Trainor highlighted New Jersey CWA members' successful fight to undo the agenda of the disastrous former governor Chris Christie, and how that model can serve as an inspiration for the entire labor movement. "Phil Murphy's election in New Jersey proves that even in the Age of Trump, CWA can win big for our members," Trainor said. "We need to talk to workers one on one. We need to build power in every workplace. We need to educate every member about what is at stake, at the bargaining table and in the halls of Congress." The conference also featured rousing speeches from New Jersey Governor Phil Murphy, who is working with CWA members to rebuild New Jersey in the wake of Chris Christie's attack on working people, and from congressional candidate Alexandria Ocasio-Cortez, who recently won a stunning primary victory over incumbent Rep. Joe Crowley in New York's 14th Congressional District based on her energetic platform of strengthening the working class. 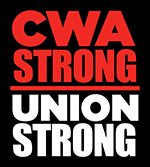 CWA members gathered in Atlantic City this week for the annual District 1 Conference. Speakers included CWA President Chris Shelton, CWA Secretary-Treasurer Sara Steffens, CWA District 1 Vice President Dennis Trainor (top left), and CWA District 2-13 Vice President Ed Mooney, along with NY-14 congressional candidate Alexandria Ocasio-Cortez (top middle), New Jersey Governor Phil Murphy (top right), and NJ-07 candidate Tom Malinowski. A new op-ed in The Hill co-authored by CWA President Chris Shelton and Rep. Lloyd Doggett (D-Texas) shines a spotlight on how the Republican corporate tax bill rewards and incentivizes the offshoring of more American jobs, and calls for Congress to pass Doggett's bill, the No Tax Breaks for Outsourcing Act, to stop this disturbing trend. Many of the companies that are among the biggest beneficiaries of the Republican tax bill, such as Wells Fargo, have already been closing American call centers and aggressively offshoring U.S. jobs. After shipping jobs overseas, these companies have been gifted billions of dollars in new tax breaks while being encouraged to offshore even more American jobs in the future. "We need to stop rewarding companies that ship jobs overseas and reverse the offshoring incentives embedded in the tax bill. The No Tax Breaks for Outsourcing Act would ensure that multinational corporations pay the same tax rate on profits earned abroad as they do in the United States," Shelton and Doggett wrote. "Our tax code should reward the creation of good jobs here in the U.S., rather than giving corporations breaks for killing American jobs." Last week, Los Angeles bank workers, residents, and consumer advocates joined Councilmember Nury Martinez in a rally to celebrate City Hall's unanimous passage of a groundbreaking amended Responsible Banking Ordinance that requires any bank that bids for the city's $17 million taxpayer-funded contracts to disclose its sales goals and other potentially predatory business practices, and called for Los Angeles Mayor Eric Garcetti to move swiftly on signing the amended ordinance into law. Bank workers, members of the Committee for Better Banks (CBB), a CWA project, and consumer allies pushed the City Council to hold banks accountable for their unethical behavior. Los Angeles is the first city in the nation to compel transparency from banks about their sales goal tactics and employee compensation. "We took power away from big banks and their army of lobbyists and gave it back to the people of Los Angeles," said Ruth Landaverde, a Los Angeles-based member of the Committee for Better Banks and a former Wells Fargo and Bank of America worker. "For too long, too many banks have gotten away with cheating customers and abusing workers with unethical sales goals and predatory practices. This rule is the result of advocacy from thousands of Los Angeles bank workers and residents and serves as a blueprint for cities across the country that want to wipe out big bank behaviors that prey on working families." 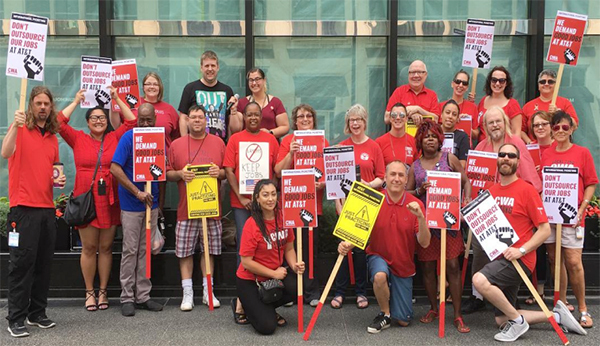 "I'm proud to stand with the frontline bank workers and their allies who have fought to make their voices heard and demanded the quality service their communities deserve," said Tom Runnion, Vice President of CWA District 9. "This is a critical victory for families and workers across Los Angeles and is an important step in bringing greater accountability to our financial industry." 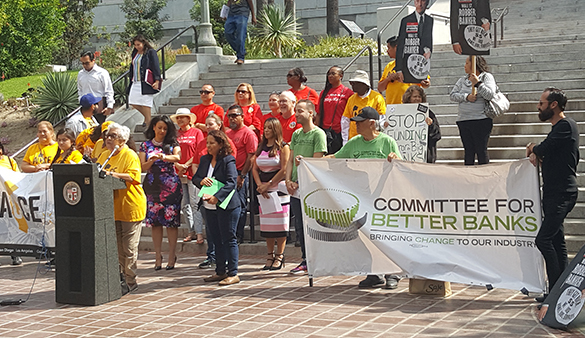 Los Angeles bank workers, residents, and consumer advocates celebrated City Hall's unanimous passage of a groundbreaking amended Responsible Banking Ordinance to hold big banks accountable for unethical behavior.